MX5Bitz was created by MX5 enthusiasts for MX5 enthusiasts. Our aim is to supply a full range of quality products and we are seeking suppliers. If you manufacture or import top quality parts for the MX-5 Eunos or Miata please contact us using the link above. You pay the part price shown + delivery and fitting kit if ordered - no hidden extras!! Please email me - sales@mx5bitz.co.uk or call 01548 581155 if you are looking for a MK1 spare that is not listed. We are always breaking MK1 cars and stock constantly varies. 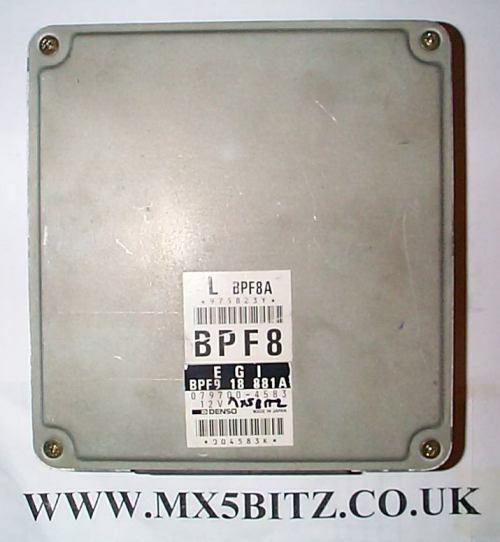 Mazda MX5 MK1 1.8i ECU 1993-5 marked as BPF8. This ECU will arrive in clean, undamaged condition. It has been carefully removed from a working car and I guarantee it to be a working item. Mainland UK : £10.00 for first and £5.00 for each additional MK1/Eunos(1989-1998) purchase. Delivery prices shown are for Mainland UK only (excludes Ireland, Highlands & Islands and overseas). Please contact us to obtain a delivery quote for non Mainland UK destinations before ordering.